Photo by CC user Conal Gallagher on Flickr. A very popular item in today’s market, the bicycle has become a staple in both transportation and sports around the world. But what really is the bicycle and when and where did it come from? Here’s a little inside information into the bicycle, then and now. Over the years there have been several different ideas as to when and where the very first bicycle came to be. With this said, currently the first verifiable claim belongs to a gentleman by the name of Baron Karl von Drais. Serving as a civil servant to the Grand Duke of Baden in Germany, Baron invented a ‘running machine’ in 1817. In German it was known as the laufmaschine, in English it was known as the drasisine and in French, the draisienne. When looking at the first bicycles, they don’t look anything like they do in today’s world. In fact, the first bicycles were more like scooters than anything else. This is because they didn’t have any type of viable steering or even any petals to use. Later in 1839, a Scottish blacksmith added in pedals in 1839. Later, during the 1890s, the decade became known as the Golden Age of Bicycles. As the use of bicycles surged, further innovations were designed with comfort in mind, making the bicycle even more interesting to people. Two years before the start of the bicycle age, a Scotsman named John Boyd Dunlop introduced the very first practical pneumatic tire. This tire soon became universally used. Shortly after, the rear freewheel was developed. In today’s society, you’ll find that the bicycle is used around the world for numerous different things. Some people use their bicycle for recreational use while others use it to get to and from work and to run daily errands. Bicycles are very popular in busy cities where driving a vehicle may serve as a bit of a challenge. For those who use the bicycle for fun, you’ll find that some are major enthusiasts using it to participate in different cycling races such as the Le Tour while others prefer to use them for cycling on the boardwalk next to the beach or for taking a stroll with their kids down the block. Even more, some have taken the bicycle to the next level with the creation of the mountain bike. This bike, with bigger tires and multiple gears, is best for those who are transverseing a mountain side at fast speeds. Because so many people enjoy the sport of mountain biking, you’ll find competitions around the world. You’ll also find that many people enjoy the bicycle as a means to get in some fun daily exercise. Because of the lack of fuel, you’ll find that the bicycle has zero negative impact on the environment. The only time that a bicycle would harm the natural environment is if you were to ride it over sensitive, hard to grow plants and flowers, which in the end would be your fault, not that of your bicycle. Because the bicycle is so environmentally friendly, you’ll find that many people purposely choose to forgo a car and ride a bike to school, the store or their job instead. The history of the bicycle spans a few centuries and proves just how much the bicycle itself has changed over the years, finally ending in what we have in today’s market. 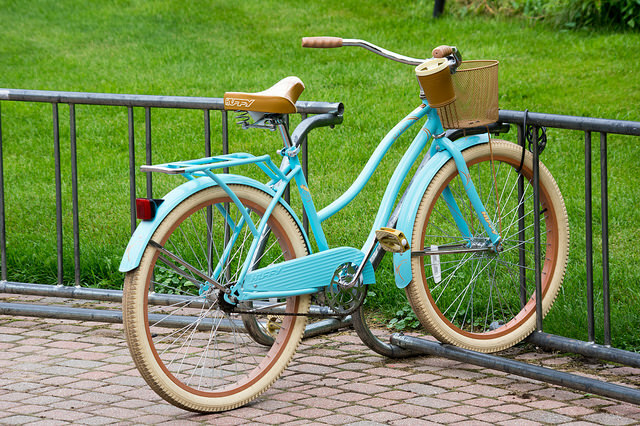 If you’re looking for a bicycle for yourself, you’ll find many different stores dedicated to helping you find the right one for your lifestyle.